Bank Failure Friday is in full swing. Tonight there were 5 more failures, numbers 73 through 77 on the year. In the biggest failure since WaMu, BB&T Takes Over Colonial. Colonial BancGroup Inc., the Alabama lender facing a criminal probe, had its banking operations closed by regulators and taken over by BB&T Corp. in the biggest bank failure since Washington Mutual Inc. collapsed last year. Branches and deposits of Colonial, Alabama’s second-largest bank, were turned over to Winston-Salem, North Carolina-based BB&T in a deal brokered by the Federal Deposit Insurance Corp., the regulator said today. The failure of Montgomery-based Colonial followed a Florida expansion that saddled the lender with more than $1.7 billion in soured real-estate loans. Colonial’s failure will deplete the FDIC’s deposit insurance fund by $2.8 billion, the agency said. The fund, which the agency uses to pay customers of a failed bank for deposit losses up to a $250,000 limit and is generated by fees paid by banks, stood at $13 billion at the end of the first quarter, according to the FDIC. The agency has set aside an additional $25 billion for bank failures, agency spokesman David Barr said. Is There Any Money Left In The Fund? Tonight, inquiring minds are asking "Is There Any Money Left In The Fund?" For clues, please consider Saxo Bank Research FDIC’s Shrinking Deposit Insurance Fund – A Testimony of Current Accounting Standards. As late as in the end of April just before the release of the bank stress tests, Ms. Bair Chairman of the FDIC said they would not need any additional bailouts from the U.S Treasury within the immediate future according to The Bulletin. After three new bank failures last Friday, the FDIC’s Deposit Insurance Fund (DIF) diminished by another $185 million for a total remaining balance of $648.1 million. 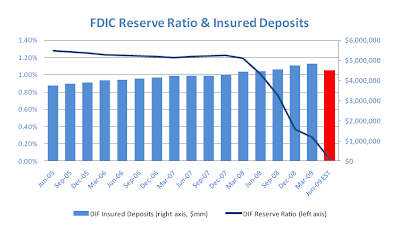 Below is a graph showing the DIF capital as a percentage of total bank deposits insured by the FDIC. Note that this graph is based on the old insurance limit with a maximum coverage of $100.000/account. This limit has been changed to cover up to $250.000/account until January 1st 2014. Estimates say that the change increases the deposits covered under FDIC insurance to approximately $6 trillion in total.